Is a passion of my heart. Celebrating the amazing women I’ve been in conversation with, I am inviting and inciting people to hear, honour and celebrate the lives of women. And to look at how we will inspire the next generations of women. I am speaking, writing and working creatively with groups, large and small (again all over the world) – a book is ‘in the writing’…. Inspired by my ancestors, my grandmothers, and Suffragette Emily Wilding Davison this work is growing – who knows where it will take me next. Last Saturday (21 January 2017), along with millions of women world wide I joined the Women’s March, my ground was London. What a day – there we had over 100,000 wonderful people. Diversity was there in all dimensions, many marching on behalf of those who weren't able. Huge humour in the placards and grounded, inspiring speeches energised and connected us all. Women of Wit, Wisdom and Wonder’s Blog is so timely… Posts will be coming as the conversation/ writing fits. Join this conversation of inspiration and celebration. It’s sorely needed. 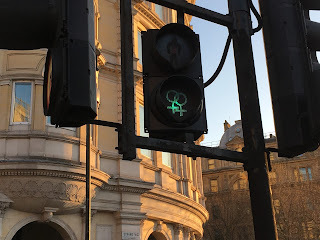 The image - road crossing sign at the side of Trafalgar Square, London last Saturday. Someone somewhere had a stroke of genius idea, and acted. Great timing Penni. Looking forward to joining the conversation! Just added the picture - genius! Love the traffic lights! What other signals did you pick up of change at the march?